Learn the basics of knotting with string using specialized tweezers. Learn the basics of jewelry design and beginning stringing techniques. 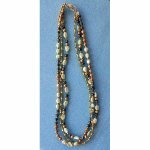 Learn the basic wire and wire-wrapped loops used to connect beads with wire.